A couple of Sundays ago, I woke up at 8 a.m. instead of my normal 10 a.m. (Hey, I like to sleep in on the weekends!) 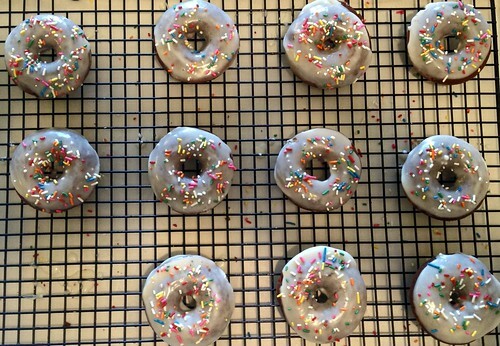 With no plans aside from laundry until the afternoon, and no AP flour to be found but tons of cake flour, I decided baked doughnuts using cake flour were on my morning agenda. As expected with baked doughnuts, these taste nothing like the real thing, but are an easy way to feel less guilty about basically eating cake for breakfast. Not too dense, with a rich chocolate flavor, these were easy to make and the perfect Sunday morning treat. Combine the flour, cocoa powder, sugar, baking powder and salt and whisk together. Stir in the milk, eggs, oil and vanilla until well combined. Transfer the batter to a large plastic bag and cut one corner off. Pipe the batter into greased doughnut pans, filling 2/3 of the way. Bake for 8 to 10 minutes or until springy. Allow to cool in the pans for five minutes, then transfer to a wire rack. Warm the milk and vanilla in a medium saucepan set over low heat. Add the confectioners’ sugar and whisk slowly until well combined. Remove from heat and set over a bowl of warm water (you may have to reheat over low heat occasionally). Dip doughnuts in glaze and place on rack to set. 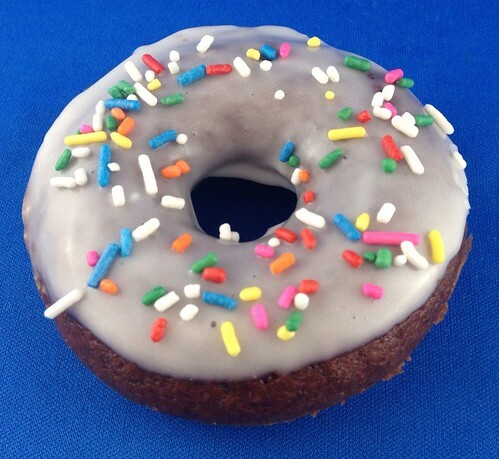 Doughnut recipe from Cassie Craves. Glaze recipe from La Mia Vita Dolce. Nothing like a home made doughnut! Oh Hilary this is so timely! I’m not much of a donut fan, but just last weekend I finally stumbled into the new “it” donut shop in Portland called Blue Star (Voodoo Donuts is SOOO yesterday). They had some amazing flavors and glazes, such as their blueberry, bourbon and basil glaze. Between the visit to Blue Star and this blog post I’m now officially inspired to try making donuts for the first time! Not sure it will happen before I leave for my trip, but will remain on my “need to make” list! Thanks – great blog! Mary, I hope you have an AMAZING time on your trip!